In order to be safe for use in the hazardous locations, pressure sensors that are suitable for use in that hazardous area need to comply with one of the many protection types available. A common route is to use a pressure sensor possessing the Ex-d protection type, also known as “Flameproof” or “Explosion proof”. These are transmitters that are designed to be suitable for hazardous areas designated as Zone 1(21) or 2 (22) in accordance with the ATEX classification, and can be used in Class I, II or III areas in accordance with the North American classification. But what really makes an “Ex-d“ pressure transmitter so special? An Ex-d pressure sensor must have a flameproof / explosion-proof enclosure. This simply means that the transmitter’s electronic components should be mounted inside a housing that has been carefully designed to ensure that, should an explosion occur within the enclosure, there is no possibility of the flame propagating outside the enclosure. The flame will be completely contained within the enclosure! 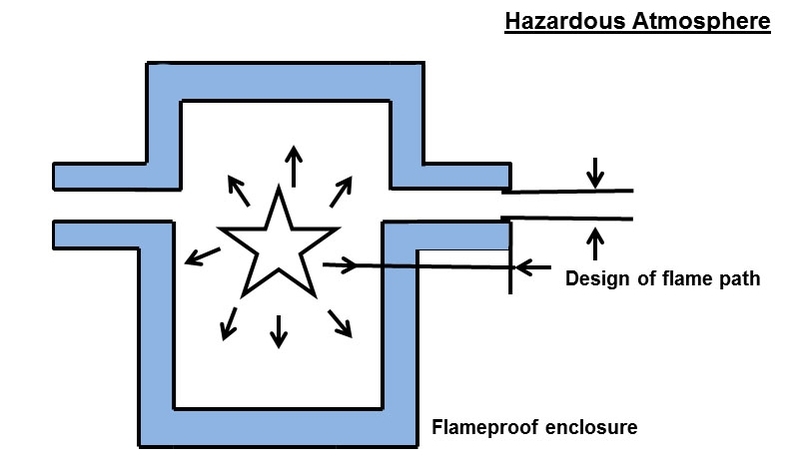 A critical factor in the design of explosion-proof enclosures (Ex-d protection method) is the need for Flame Paths. These enable burnt gases, resulting from the explosion inside the pressure transmitter housing, to cool down as they exit the enclosure so that they are no longer able to ignite the potentially explosive atmosphere outside (the combustible fuel-air mixture in the surrounding area). The design of flame paths requires a great attention to detail to ensure they are long enough and narrow enough to cool down the ‘escaping’ gases to a level that ensures the safety of the application. Another important factor is the thickness of the enclosure walls, which must be carefully designed to ensure that heat transfer from within the enclosure – in the event of an internal explosion – will not raise the temperature of the outer surface of the housing to a level where the combustible fuel-air mixture surrounding the pressure transmitter can be ignited. All of these factors mean that when you are looking for an explosion-proof pressure transmitter, you should find a reliable manufacturer with sufficient engineering experience to ensure that both the design and the manufacture of the transmitter meets the required standards and ensures the safety of your plant.